My jacket is a NEW LOOK. T-Shirt, Short & Shoes by H&M. 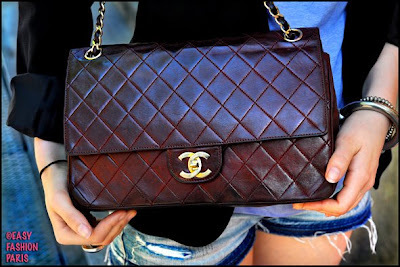 My bag is a vintage CHANEL (50's ?) in perfect condition. It's a gift of my Ch�ri ! Fashion is not slavery. My look is classic. I love tatoo's and piercings. I don't like rude people. My message to the world: Leave me alone !